The UCLA women's volleyball program began its first year in 1965. Andy Banachowski had been the head coach each year since 1965 until his retirement after the 2010 season, with the exception of 1968–69 when he graduated from UCLA. In that season, Mardi Hardy was the head coach. Michael Sealy took over as head coach in 2011 and led the team to a national championship in his first season. Banachowski had more wins than any other NCAA Division I women's volleyball coach, with a record (since 1970, since no records were kept from 1965–1969) of 1,082–292. Banachowski had led UCLA to six national championships (3 NCAA-1984, 1990, 1991; 2 AIAW-1974, 1975; and 1 DGWS-1972). UCLA has made 27 of 28 NCAA tournaments and has made 11 NCAA Final Fours, which is tied with Nebraska as the second most Final Four appearances of all Division I programs. UCLA claimed the program's first national title after two previous runner-up finishes. In the deciding fifth game against Stanford, UCLA was down 12–4, but with heroics from Liz Masakayan, the Bruins continued to chip away at the lead before earning match point at 14–13. Masakayan had the final kill to give UCLA the 15–13 win. UCLA won the NCAA title by defeating Pacific 15–9, 15–12, 15–7. UCLA was led by Natalie Williams and Marissa Hatchett who had 12 kills a piece. The Bruins finished the 1990 season 36–1. Playing at Pauley Pavilion, the Bruins repeated as NCAA champions by defeating Long Beach State in five games. After losing the first two games by the scores of 15–12, 15–13, UCLA completed off a huge comeback to take the next three games, 15–12, 15–6, 15–11. 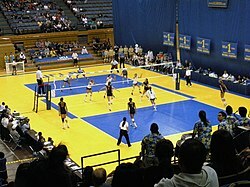 After 20 years, the UCLA Bruins captured their fourth title in history by defeating Illinois 3–1 on December 17, 2011 at the Alamodome in San Antonio, Texas. The Bruins were seeded 9th in the NCAA championship tournament. Enrouting to the title game, they defeated 4-time defending champions Penn State and No. 1 seeded Texas to face No. 3 seeded Illinois. Rachael Kidder was named the most outstanding player of the tournament. Lauren Van Orden and Zoe Nightingale were also named to the all tournament team. Head coach Michael Sealy is now a champion both as a player and a head coach. The Women's Volleyball team is featured in the new Pac-12 Networks Promo for the 2012 season. Note: No records were kept until the 1970–71 season. All seasons are under Andy Banachowski. Former players who have gone to the Olympic Games to play or coach. The UCLA Bruins have an NCAA Division I Tournament record of 90–32 through thirty-five appearances. ^ "UCLA NCAA Women's Victor; Hatchett, Williams Key Win Over Pacific". The Washington Post. 1990-12-16. Archived from the original on 2012-10-25. Retrieved 2009-03-24. ^ "UCLA wins NCAA volleyball title". Austin American Statesman. 1991-12-22. Retrieved 2009-03-24. ^ "UCLA featured in Pac-12 Networks promo". Retrieved 21 August 2012. ^ "Division I Women's Volleyball Championship Records Book" (PDF). National Collegiate Athletic Association. Retrieved 6 August 2018.